Professional traders use price action to determine where future prices will likely go. This is difficult now because with the new highs, we do not have any supply to mark the probable top. Last week, the FANG stocks, (Facebook, Amazon, Netflix, and Google) caused the Nasdaq index to retreat quickly from highs. This may not be the peak of the market, however. It could be a small profit taking period or the start of a large correction. So how are traders supposed to know or react? In past articles, I have highlighted the use of the Relative Strength Index (RSI) as a tool for measuring price momentum and changes in trend. We can apply this indicator to our index price charts and even individual securities to assist us in identifying future movement. As with any technical indicator, the RSI should be used as a confirming indicator, not a decision-making tool. Price and supply and demand should be the only thing you use for your decisions to enter or exit the markets. Looking at the chart below of the market crash in 2008, we can see that the RSI gave us several signals before prices dropped. 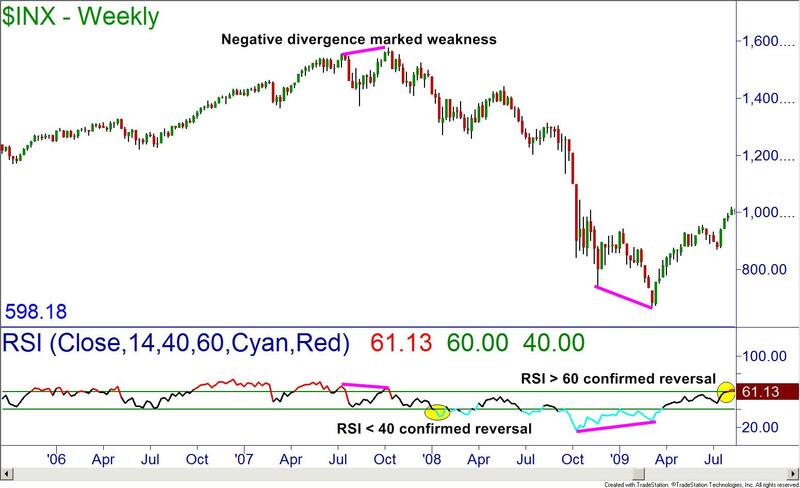 The negative divergence of price and the indicator was a powerful signal, warning investors of weakness in the market. Looking now at the current weekly chart of the S&P 500, we do not have such a signal yet. The momentum is still strong while prices are making new highs. This suggests the trend will continue for now. Turning to the Nasdaq index, we see a different picture. While prices have been moving to new highs, the momentum is dropping. This negative divergence is a warning for those invested in tech stocks. The Dow Jones Industrial Average is following the path of the S&P 500 and moving higher on increased momentum suggesting continued bullish movement. The proverbial canary in the mine shaft for the indexes is usually the Russell 2000 index. Since the index consists of smaller US based companies without as much international exposure, it usually reflects the American economy better than the other indexes. It was the first index to drop in the 2008 crash, and also the first to recover. Currently it is also exhibiting negative divergence like the Nasdaq. This is a bearish sign. Don’t panic though. The warning is only on two of four indexes. We are likely to continue to see higher prices and new highs. The divergence is only a warning, not the signal to sell or sell short. To know when the time is right to short the markets, you need to understand how to identify the dominant trend in price. This is critical, because if you try to short in an uptrend you will likely suffer losses. When it comes to trading in the trend, you do not always have to be first, but you do not want to be wrong. Visit your local Online Trading Academy office today and discover how you can learn to read price and trends the professional way in small classes taught by active, profitable traders.